Select the container where you want to plant your Astrophytum seeds.It can be a seed tray or a pot with a shape of a pan. Avoid long pots because you will waste substrate due to the short roots of the plant. Another option is to use a plastic cup to sow. The Astrophytum is a cactus so, the adequate soil must be one with good drainage. 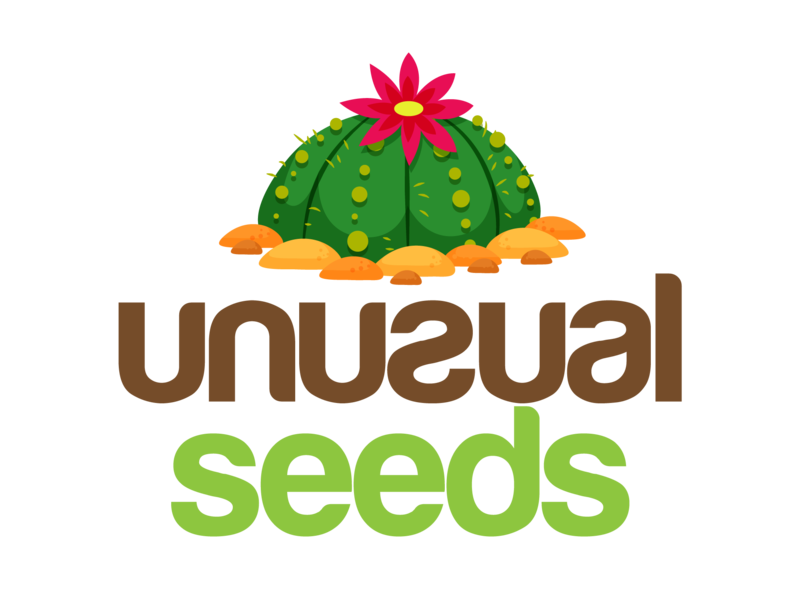 To have the right substrate, combine cactus mix with another element that allows drainage, for example, perlite, sand, pumice, granite stone, or vermiculite. If you do not find the cactus mix, you may opt to use potting mix, but try to find the cactus mix. The Astrophytum cactus is prone to bacteria and fungus, to avoid this, it is necessary that you sterilize the soil before planting. Also, it is important to highlight that you must remove any particle from the substrate, and you can do this to avoid the formation of fungus. 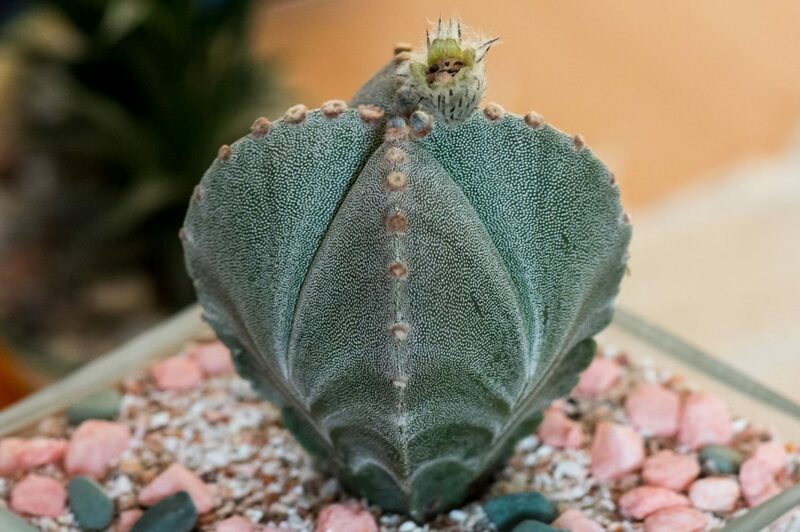 Proceed to fill the pot and moist the substrate, but do not add so much water because the Astrophytum is delicate and don’t tolerate over-watering. Once the soil is moist, put the seeds in a gently way over the substrate, you do not need to bury them. Cover the pot with a glass sheet, a white paper or something that maintains the humidity in both the container and the seeds some people, prefer to use a plastic bag and wrap the pot with it. Keep the flowerpot or the seed tray in a light shadowy place, if the country where you live the sun is hidden or you are planting in winter, provide the plant or seeds with the necessary temperature (heat math). Once the seedlings appear, is time to let them get accustomed to the sun, Astrophytum plants love the sun, start putting the seedling a few minutes every day and increase the time to the sun progressively. Remove the weak plants because they are the most prone to contract pests and diseases. If you planted in a seed tray, is time to replant. Watering: like every other cactus the Astrophytum does not like water, you should water them when needed, the best way to know when the plant needs water is touching the soil, if it is dry it’s time to moist it. In summer water only when needed. In summer water only when needed, and in winter do not water the plants because they enter in a dormant phase, so the water during winter will kill them. Temperature: it depends on the season of the year, in summer the ideal temperature is more than 21º C (70º F). They are not friends of winter, so it is highly recommendable to use a heat mat and maintain the temperature mentioned above. During spring and fall, the minimum temperature is above 15º C (59º F). Fertilizer: use fertilizer during the growing phase, you can use one of your preference as long as it is cactus-friendly, and has low nitrogen levels. Light: a spot with direct sunlight is the best place. Some countries have an intense sun that when the plants face the sun, they get burn. In cases like that, the perfect spot for the plant is in a light shadow. When summer arrives, it is necessary that the plant faces the sun at least two hours every day. 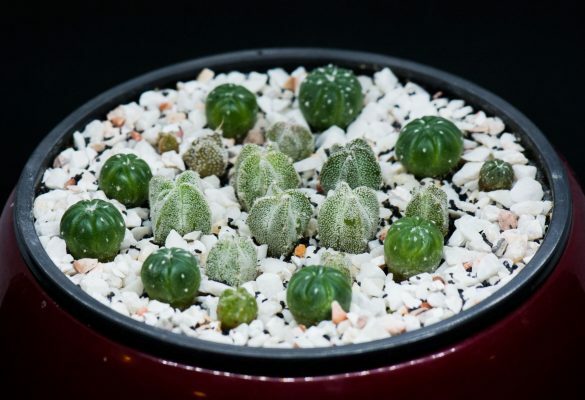 Cutting: the way to propagate Astrophytum plants is by seeds, once you harvest them proceed to plant them, but be aware that the seeds are fragile and if you treat them wrong, no germination will be the result. Repotting: to unleash all the beauty of the Astrophytum is advisable to re-pot it in every growing phase, doing this will make it look its best. Do not forget to use protective gloves when repotting due to the thorns it has. When doing this, change the old substrate for a new one. It is important to highlight that these plants are hard to grow and it may take years to see it with flowers. Pests and Diseases: the excess of water will lead to rotten roots, and if the soil is infected it will cause fungus and dark spots at the bottom of the plant.